Large open-plan kitchen and dining area with French windows opening up onto a balcony. The ground floor of Chalet Ann consists of a stunning lounge with double-height ceiling, large log fire as well as two bedrooms with en-suite bathrooms. Impressive lounge with double-height ceiling and large log fire. 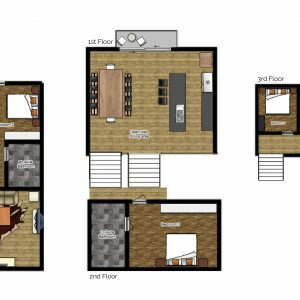 Master bedroom with extra bed on a small mezzanine level and en-suite bathroom. Shared family bathroom - Luxurious with freestanding bath tub as well as a separate large shower! This luxury ski chalet has five bedrooms and 4 bathrooms - Situated near the traditional ski village of St Martin de Belleville. Upstairs double bedroom that shares a family bathroom. Three bedrooms have private/en-suite bathrooms whilst two share a large family bathroom. Balcony with exterior seating and breathtaking mountain views. Chalet Ann is a stunning luxury ski chalet which has been tastefully renovated retaining many of its original 19th century features. Now fitted out to a high spec it is a perfect marriage of the traditional with the contemporary. As soon as you step in the front door, you are welcomed by a beautiful cosy living room with a real log fire. The chalet has wi-fi, a wireless speaker system and a Google Chromecast so you can watch your own videos on the Smart TV. It’s a perfectly equipped space for winding down after a busy day on the 3 Valley slopes! The large, open-plan kitchen/dining area on the first floor is the heart of Chalet Ann – a great sociable space for all the guests to gather to cook and eat. It has the added bonus of uninterrupted, breathtaking mountain views through the sliding doors which open out onto a balcony. There are five spacious bedrooms in Chalet Ann, three of which have an en-suite bathroom whilst the two top floor bedrooms share a luxurious family bathroom with freestanding bathtub and shower. Chalet Ann is located in the idyllic hamlet of Le Châtelard: just 1km from St Martin de Belleville! By car you can reach the ski slopes in less than 5 minutes and park for free in the ‘Le Cochet’ car park beside the gondola. It’s very easy! Le Châtelard is a quaint traditional French hamlet, making the location ideal for families with children or large group of friends who want to socialise in a spacious chalet in the evenings. For those who want to venture out for a nightcap the village can be reached on foot in around 20 minutes! The renowned ferme auberge ‘Le Chantacoucou’ can be seen from the balcony and just a 2-minute walk from Chalet Ann. It’s a lovely farmhouse restaurant where owners Bernard & Josette warmly welcome you for a traditional meal, prepared with products from their very own farm. Delicious home-cooked food at its absolute best! 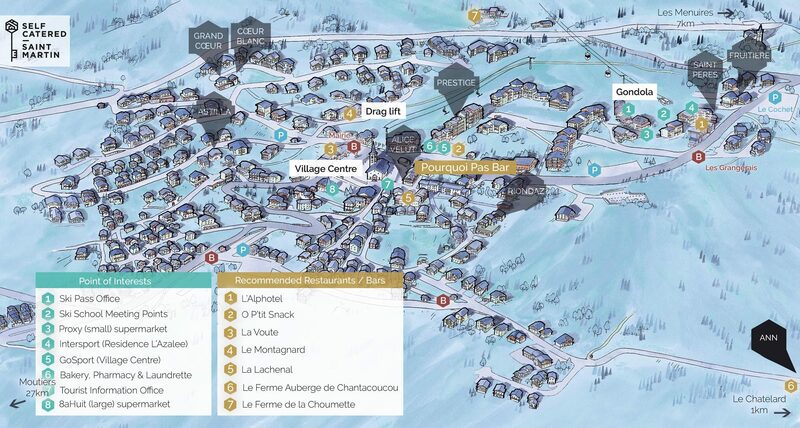 The prices above allow up to 11 people in ‘Chalet Ann’. "EXCELLENT CHALET, GREAT HOSTS & PERFECT LOCATION"
"[...] The chalet has 5 bedrooms sleeping 10 comfortably. Every bedroom has an en-suite and double/twin beds. We are a group of 2 families with 3 boys and 2 girls. All teenagers with their own space needs. The chalet was plenty big enough. We've booked next season up already to come back to Camarine!"